IRISnet is working to build a solid foundation for the construction of DApps in a way that easily integrates with off-chain resources, interoperates across various chains, and is accessible to businesses of various sizes, including small businesses. IRISnet plans to accomplish this by using a service-oriented infrastructure that is incorporated with the Cosmos and Tendermint protocols. Cosmos is a network of various, independent blockchains and Tendermint is a Byzantine-fault tolerant consensus algorithm. Lack of interoperability among different blockchains. Disconnection of off-chain and on-chain resources. IRISnet will have a similar network to Cosmos and be considered one of the hubs of Cosmos. IRIS helps connect external blockchain or legacy distributed business applications to the Cosmos system. As IRIS is a part of Cosmos, the existence and success of IRIS depends on the existence and success of Cosmos. IRISnet would connect consumers and providers through endpoints, which are request tables and response tables. 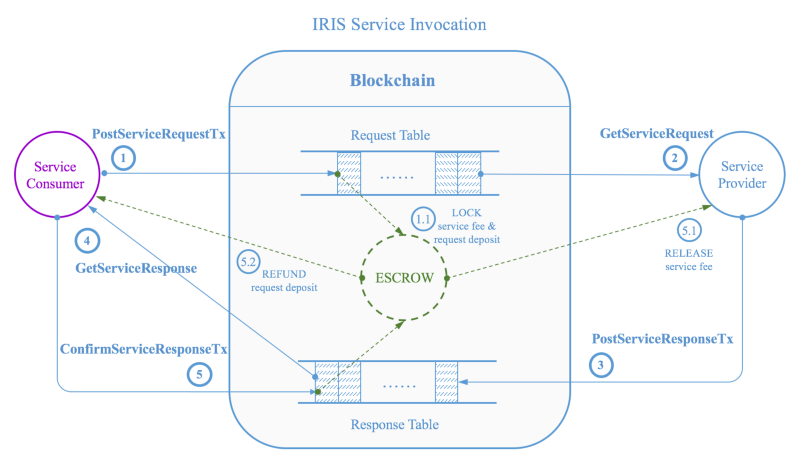 A consumer seeking a service through IRISnet would post a service request, which would be stored in a request table on the blockchain. As the consumer posts their service request, the allocated funds for the request would also be placed in escrow on the blockchain. A service provider would pick up the service request and complete the necessary work, which could be done off-chain or on-chain. After the service provider completes the necessary work, they would document a response stored in the response table on the blockchain. The consumer would then confirm that the service was completed, which would also be documented on the blockchain and trigger a release of the funds held in escrow. IRISnet is acting as an intermediary between a service provider and a service consumer, each of which may or may not need or provide blockchain services. Regardless of whether the services required are on-chain or off-chain, IRISnet records the request and response tables on-chain. 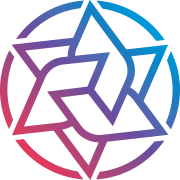 If there is a dispute between a consumer and a provider on IRISnet, a similar mechanism to the above would be used, with complaints being documented in complaint tables and solutions being documented in resolution tables. Data and analytics — the IRIS service provider SDK could be used to build data and analytics services on the IRIS network. These services could be used in e-commerce or other markets, such as healthcare. E-commerce — services on the IRIS network could be used to support distributed e-commerce applications, creating an online marketplace with a novel back-end infrastructure, but a familiar front-end user experience. Hybrid architectures — the IRIS network would make it possible for organizations to collect and relay data from both public and consortium chains. Organizations could access multiple different chains by using IRISnet instead of having to create a different plan of access for each separate chain they want to access. IRISnet will use a multi-token model consisting of staking tokens and fee tokens. A native staking token called “IRIS” will provide voting power in the governance of IRISnet, as well as be integrated in IRISnet’s consensus engine validators. IRISnet will use two types of fee tokens, network fee tokens and service fee tokens. The network fee token will be used for payment to validators and spam prevention, while the service fee token will be used as payment to service providers. IRIS token will be the default payment service token. IRISnet will also support all whitelisted fee tokens from Cosmos, such as Photon. As such, IRISnet service providers will have the ability to ask for any token available on the whitelist when charging for their services. “if and when the IRIS network is fully deployed, the annual inflation rate of IRIS tokens will be adjusted to account for the fact that a substantial portion of IRIS tokens in circulation may be voluntarily staked by participants to participate in the consensus engine” (IRISnet Whitepaper, 2018). The IRISnet project, including the whitepaper, is still under active development. As the project develops or is completed, various details about the project may change. IRISnet’s core team is composed of members with extensive technical experience in the US and China. Some of the team members have been involved with other blockchain projects, such as Bianjie AI, Cosmos, and Tendermint. IRISnet is complementary to Cosmos. Both IRISnet and Cosmos are creating novel blockchain-based solutions that may be useful to businesses and developers of DApps. IRIS Network. (2018). Retrieved from https://www.irisnet.org/. Accessed July 18, 2018. IRISnet Whitepaper. (June 19, 2018). Retrieved from https://github.com/irisnet/irisnet/blob/master/WHITEPAPER.md. Accessed July 18, 2018. Cosmos. (n.d.) Retrieved from https://cosmos.network/. Accessed July 18, 2018. Cosmos Whitepaper. (July 6, 2018). Retrieved from https://cosmos.network/docs/resources/whitepaper.html#introduction. Accessed July 18, 2018. Tendermint. (2018). Retrieved from: https://tendermint.com/. Accessed July 18, 2018.